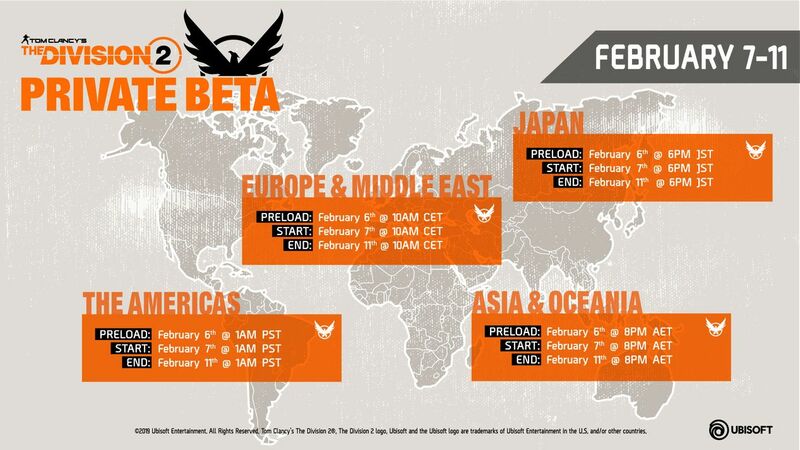 If anyone cares the beta starts tomorrow (8th Feb) at 10pm and ends on Tues 12th Feb at 10pm. You can pre-load it now from the Uplay launcher. 3. Click on the icon "The Division 2 Private Beta"
Last edited by EvaUnit02; 7th February 2019 at 6:08 am. The timing is terrible as I'm off for a wedding Sunday overseas. But put in over 500 hours in the Original which only got better with time. Devs appear to have learnt a lot so can see myself putting in many hours this time around too. I liked the 1st one apart from the annoying bullet sponge enemies and if I remember correctly it had a bit of a SP mode to it so you didn't have to go into the MP side of it. This should be another good game and hopefully will have a interesting story. Preloaded and good to go! Hmm I just got an code popping up through my xbox messages. Yep, it's all pretty standard fare so far. Teamed up with BlueKiwi. We came across a couple mission breaking bugs. Will play some more tomorrow. Downloading on PS4, all go for tomo night: no work for once and keen to hit up the Bullet King and Alex. Beta is live now apparently. Yeah Haisley and I jumped on circa 10pm last night..
Quite a few mission stopping bugs as he said (in one case, the door the enemies were behind did'nt open to let them out and so they were behind it with the required key card and the other the script didn't trigger showing we had rescued the civilians in a room), a few disconnects because reasons and I had a whole lot of stuttering/lag that I'm putting down to server side issues. Add me on ubi if you're playing on PC. Played the first main mission, including fighting the bullet sponge boss. It's more of the same as the first game. If the first game wasn't your thing this one isn't going to change your mind. They reworked the health system and they seem to have replaced awkward mantling with fast vaulting. We're going to try this out tonight. never tried the first game. The The Division 2 servers will shut down for maintenance on the Fri, 8 Feb 2019 from 21:30 UTC+13 to 00:00 UTC+13. It will last approximately 3 hours. Bro they always did the server maintenance at the worst time for NZ even in the original lol. Always 9:30 until midnight etc every time! I wish every game had UI customization and item stats this comprehensive. AI seems a lot more proactive than Anthem.